I'd like to share with you a couple of replays for you to mull over. I remember reading a thread in which a well decorated unicum asked why he was being raged at and for me, I thought, given his tiering in that battle and his tank, was guilty of camping and over conservative... with my battle count and experience that goes with that, I try to play the map, my tier and my tank vs what I think is going to happen. With 14 strangers I find it hard to commit to a "all eggs in one basket" situation before I absorb enemy distribution and with a tank that cannot very well escape. If I play light tanks, this is not much of a problem and I am guilty of playing too aggressive with this class but for all other classes, I tend to play a more conservative and thoughtful game, like I said, I consider my tier in battle, my tank, the map, team distribution and my opposition. I can be a right salty insufferable [edited word] when I see teammates play like morons basically and melt in seconds and ignore the obvious, go to stupid parts of the map that don't suit tier, tank class, cannot be defended, are vulnerable and just clowning around. This annoys me, otherwise, I am actually a very chilled and composed player regardless of how many tanks I face or if I have 0 kill or 10 kills, 0 dmg or huge damage, it doesn't force my hand and it doesn't make me do what I feel will compromise what I believe to be the right call, if in a position to do so. That being true, I always look for ways to improve my game, make me a more rounded and solid player so I would ask you to please take a look at these two replays from this evenings short session, which showcases my more typical approach to maps with my experience of them and that unknown 29 other player factor and tell me, am I total camper or did I actually carry, or strongly influence the results? Maybe there is more I can do and if so, what? What would you do different? Would that have worked better? Look at it as though live and not in hindsight. Now that I know where the enemy tanks went its easy to say I should go here or go there but judge it as though a live battle which is what any replay is the time of its recording. Also, have you any such considerations to your battles? If so, by all means attach a link and lets take a look. Have you been labeled a pro camper and wonder if you're a touch guilty of it or maybe you feel that way is the winning way and the right call for that battle, do share, I wouldn't mind seeing a these replays and picking out parts I like and might add to my own game, Thanks. BTW, this is not naming or shaming or a negative post, this is all good and I'm just asking for a little advice and few tips, judge me, not the team or any player on it. Like I said, I can be a [edited word] but I don't mean it nor do I take any offence EVER in this game.. they are just strangers, we all get ticked off at this game and it's just venting frustration and I would hope all of you don't take offense when players are like this and understand that's all it is. Water under the bridge stuff, handbags at dawn, internet trash talk, don't mean a thing. Oh and why the T-34-85? Well it's the only tank I have that is availing of the "Top of the Tree" X1.5 crew skill bonus and I'm not far off seeing out a set of skill so I'm grinding on with that and trying to get as much from each battle as I can, winning being the most important part of it of course but also personal input. 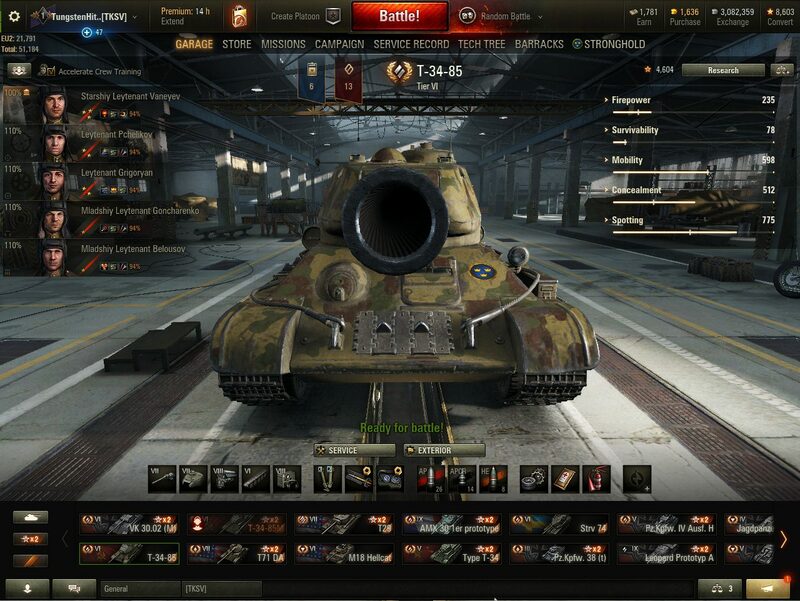 Love that HD rifling btw, looks amazing, and what a legendary tank. You know, the Tiger gets a big rep with it's infamous 88, but this is an 85, that's almost the same caliber, a big gun and there was a lot of them shooting it! scary stuff, anyone see one in real life? It's a big tank, if you're infantary and see a dozen of these ripping through the hedges and barriers spraying machine gun fire and letting loose with some HE, what a nightmare, and it didn't matter how many got taken out they just kept on appearing and coming. Savage tank. Can't get the replays to work. Old version of WOT? Edited by XxKuzkina_MatxX, 10 March 2018 - 01:58 AM. Kudos for not being a scrub and selling the T-34-85 after the T-34-85M marathon. Don't overdo the chat, keep it clean and simple. If provoked in the middle of the battle just block the dead tank. These 2 replays are of a tier 6 tank in tier 7 games. So the game play in these tiers are not a good representative for playing a tier 8 medium for example. No exceedingly good players can be found on either teams so you can get away with things in those battles. That's a TD game play. For the first part of the battle you were far away from action. You could've gone to F5/F6 behind the house to shoot tanks going to the city along the 8 line. Also from there you could shoot tanks on the other side of the middle road along the E line. If and when the city falls then you can retreat to G3. Around 11:22 in the replay, you were trying to spot the T34-85 and T21 form the bushes at A8. You couldn't because you were double-bush(ing). There were two bushes between you and the T21. You need to go to A6 for the bushes to get transparent. While you were shooting at the two Type 64s all you needed to do is to back up enough behind the bushes to stay unspotted. Make it a habit to do things the right way. The problem with camping and "waiting for the enemy" is that generally once the enemy comes to you the game is lost, your team mates (trying to win) are dead and you have not helped one bit. You make a valid point usually when we do this strategy we are in a platoon and we watch as the other players just melt, many time we have held a flank whilst everyone one else just goes with the flow. we do mainly random battles and as you will know yourself you cannot really control either the game or the other players, plus with the Matilda being so slow, what else would you suggest? I see people moan at Arty and TD's who stay in the back, I see other tell me that is where I should be if I am in a TD, when in a slow tank such as the Matilda sometimes it is best to either camp and wait or advance not too far from the cap, this is not every game, but to ride out to battle in the Matilda is a good exercise in making a brew and relaxing while you hope that you see some action before your team if they are on the ball kill the other side. Works quite well in fact. If you can put up with dead lemmings pinging the map. yeah the pingers do get to me on times. Play however you want, turn off chat, ignore post battle messages, have a slightly more enjoyable time. If you want another serious answer, STOP BEING SO ABSOLUTE! Do whatever it takes to progress. Adapt to the situation. Sometimes it's better to camp, sometimes it's better to cap, sometimes it's better to charge, it all depends on what's happening in that battle. Carrying isn't something you can do voluntary, you can be the best player in the game and a 45%-er can still blow you up with an ammo rack hit, luck is the decisive factor in the game, skill mitigates it somewhat, but it's nowhere near enough to overcome luck. The truth of the matter is this: Individual Random Battles do not matter, the key is to make a profit at the end of your day. Edited by Palora, 12 March 2018 - 02:41 PM. Don't know about that, most Unicums who i see are almost always on the front line except rare cases when they play a tank that is not meant to be on the front line. Also what i noticed is rather they stay and die on a dead flank, they usually retreat if the flank is lost / or they get very low and retreat then to keep one more gun in the game to eventually try to win. Was in more than ocasion where i held a flank by my self against 5 tanks, i was actualy ultimatly doomed but wonderd how to [edited]they dont run over me, 5-1 wtf right but it proved useful couse alowed my team to mop up the opposition. Edited by PauI, 13 March 2018 - 01:23 PM.